I prepared this for my son and Father in law birthday. Both of them like cakes a lot and it falls on the same date. Vanilla Chocochip Cake was soft and yummy. Warm Water - as required. Melt butter in microwave for 10sec. In a wide bowl, add butter and mix all the wet ingredients by using a whisk or hand mixer slowly. Seive all dry ingredients and mix it slowly to get a batter. Grease or spread butter paper to 7 or 8 inch round baking dish. Pour the batter. Bake it for 45mins. Check with a fork or skewer when it comes out clean or bake it for 5 to 10 mins more. Can also brush warm milk and allow it to cool. You can do icing with Nutella spread. I did later for my son with Nutella. 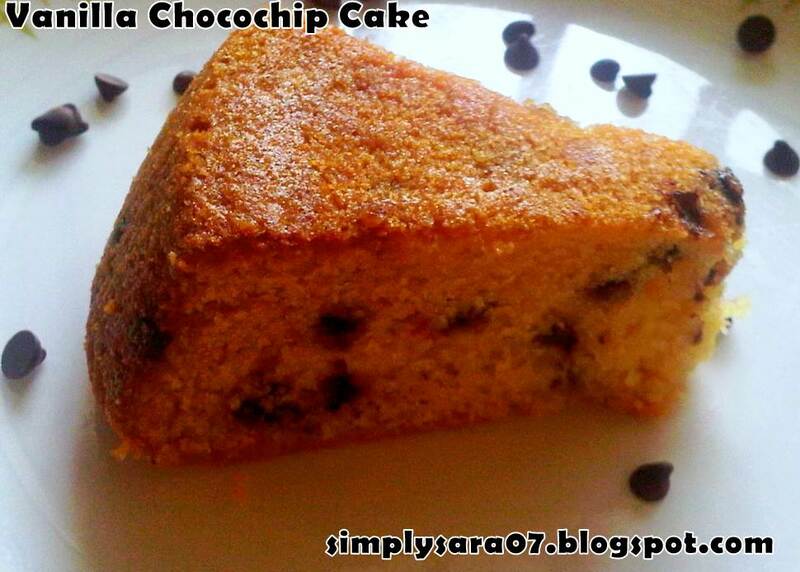 Enjoy the Eggless Vanilla Chocochip Cake with coffee/Tea. 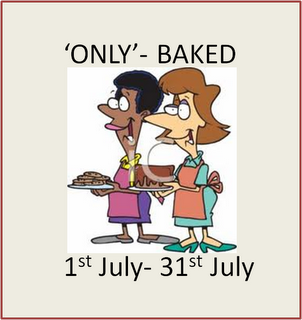 This recipe is going to Only Baked Event by Harini and Pari. Thanks Priti for the quick comment. Yes they enjoyed. Belated birthday wishes to both of them.. The cake looks so rich.lovely picture. looks very spongy! thanks for sending this to our event. B'day wishes to you son n father in law! Vanilla and choc chips.. heaven.. love the fact it being eggless..
only one piece what happen other pieces...b4 taking photo u finished it aha? perfectly done!! Birthday wishes to your son and father in law. The cake has come out so spongy and good. Thanks you friends for your comments. @ Rekha - Yes I sent it to Chennai for my BIL. Looks delicious. Thank you for sharing.